Here are some facts about Usain Bolt, the incredible sprinter from Jamaica. Usain Bolt was born in Trelawny, Jamaica on 21st August 1986. He is 6 ft 5 inches in height – very tall for a sprinter. When he was a young, Usain spent his time playing and thinking about sport. He loved playing football and cricket. At high school, he started to get into athletics and in 2001 he got the 200m silver medal in the Jamaican high school championships. At the age of 15, Bolt was the sam height he is now (6′ 5″). Bolt won many medals as a junior athlete, including 4 golds at the 2003 CARIFTA Games. Usain Bolt turned professional in 2004. He was eliminated in the first round of the 200m event in the 2004 Olympic Games in Athens – he had a leg injury. In the 2005 World Championships in Helsinki, Bolt qualified for the final, but finished last. In the 2007 World Championships in Osaka (Japan), Usain won a silver medal in the 200m. Usain Bolt took that 2008 Olympic Games in Beijing by storm. He won the 100m in a record time of 9.69 seconds, and he won the 200m in a record time of 19.30 seconds. 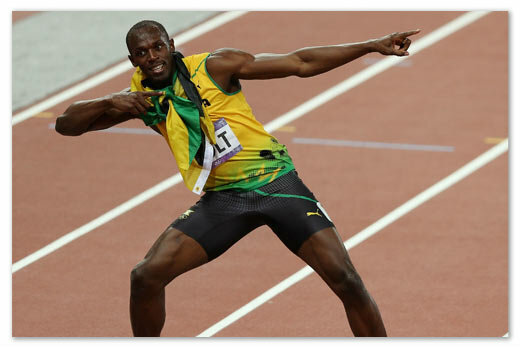 Along with his Jamaican teammates, Bolt also won gold in the 4x 100m relay. At the 2009 World Championships in Berlin, Bolt improved on his 100m world-record, winning the event in a time of 9.58 seconds. He also won the 200m in a new world-record time of 19.19 seconds. In the 2012 Olympic Games in London, Bolt won the 100m with an Olympic record time of 9.63 seconds. He also won gold in the 200m and the 4x100m relay. Bolt enjoys dancing, DJing and he still plays cricket. He has said he would like to play cricket in the Big Bash League (Australia’s Twenty20 league) and he has also said he wants to play football for Manchester United after he retires from athletics. He is nicknamed Lightning Bolt. Bolt can run at a speed of about 23.7 mph. He has his own iPhone app called Bolt! He owns his own restaurant / sports bar called Tracks & Records. Check out Usain Bolt’s website. Thanks for letting us know, Maria. Glad you found some useful information about Usain Bolt for your test. Please visit us again soon! thanks this will help me with my biography test about usain bolt!!! These are a very interesting facts about Usain Bolt.It helped me in my english elocution,my teacher was impressed about this!!! it is great for my learning it help me alot. Work in a school and wanted some information my son could easily read and understand the facts. Great information and the most important facts to interest and child doing their homework!!. We already have! Check out this article. Thanks; this really helped out my homework on usain bolt, very simple and easy to understand. thank your for you great information on Usain Bolt i will be doing a speech on him for apart of my englIsh GCSE great help thanks .